What happens when seasoned performers Kevin Brooking and Colm O'Grady create a show after 2 years of improvising with 100's of frying pans and a grain of popcorn? The result is "Naked Lunch". 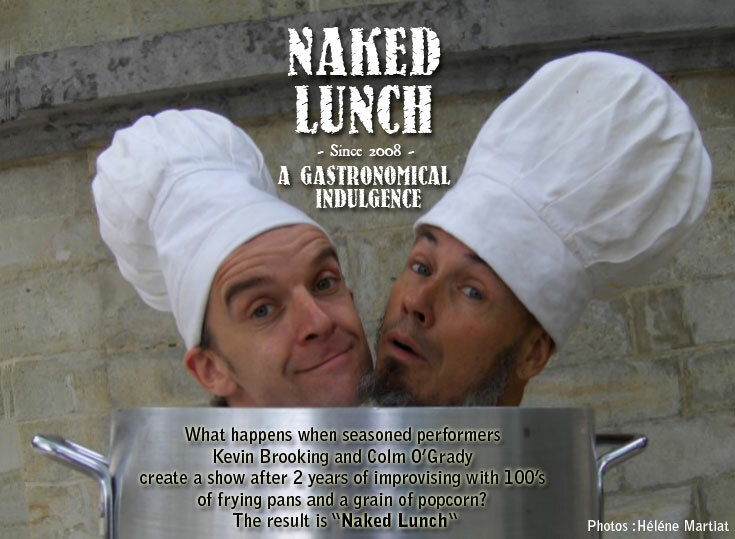 "A Gastronomical Indulgence" What happens when seasoned performers Kevin Brooking and Colm O'Grady create a show after 2 years of improvising with 100's of frying pans and a grain of popcorn? The result is "Naked Lunch". Two gastronomically challenged characters Lloyd and Harold pretend to be French chefs from French France. "C'est Bon!" These culinary wizards are ready with the recipes if they can only figure out how to light the oven. First on the menu is their invention of probably the world's first "Frying Pan Xylophone". From a flambé of 'Bolero' to a soufflé of 'Star Wars' exquisite music is played upon the finest selection of pots and pans. Food for the ears! Watch out for an explosive miracle… From a single grain they make enough popcorn to feed a whole audience! Food for thought. Dessert - The Pandango- an acrobatic hoochie coochie dance for two kings of burlesque and 4 four frying pans. A hilarious feast for the eyes. Naked Lunch is available for Street Festivals, Cabarets, and Theatres. It is 35 minutes long. Needs a quiet wind free space for outdoors and a minimum 5 x 5 meters of stage area.